"Oh, so you work with deaf people...so does that mean you know Braille?" I am sure many of you who have told people you are interested in sign language have heard a question similar to the one above. Although Braille is used by the blind, people often confuse it as a tool for the deaf. As a former teacher of deaf and hard of hearing children, I have witnessed confusion between deafness and blindess several times in my career. I am not sure why people confuse deafness and blindness...and the communication techniques of each, but it happens all the time! I wonder if it has something to do with the famous story of Helen Keller (see video below). She was a deafblind woman who used, among other things, sign language to communicate. But it was tactile signing that she used, not American Sign Language. As a young man I saw the movie, The Miracle Worker (1962), in school. I think everyone in my class learned the sign WATER from watching the story of the young Helen and her teacher, Anne Sullivan, unfold in-front of us. Because of the combination of deafness and blindness in some individuals, such as Helen Keller, I would like to give you a little background about how people who are deaf AND blind are communicated with. Anne Sullivan was the first true intervener, although it was not called that in her day. An intervener (or intervenor, in Canada) is defined as a person who provides intervention to an individual who is deaf blind. An intervener mediates between the person who is deafblind and his or her environment to enable him or her to communicate effectively with and receive non-distorted information from the world around them. An intervener acts as the eyes and ears of the person with deafblindness. The promotional video below from George Brown College, in Toronto, Canada, does a nice job of explaining what an intervener does. Many people confuse the role of an interpreter and an intervener. An interpreter is a person fluent in sign language that has gone through an interpreter training program and certification process. An interpreters primary role is to mediate communication between the hearing and the deaf. A person CAN be both an interpreter AND an intervener. In addition to the standard interpreter qualifications, the person would need to have training in the field of intervention with deafblind people. But, one DOES NOT have to be an interpreter in order to be an intervener. Some people who are considered deafblind may not use sign language but still may need the services of an intervener. Further, some deafblind people may also have additional special needs such as cognitive issues that cause them to not have a large sign language vocabulary so an intervener that works with them may be able to have some knowledge of sign language but not nearly that of a certified interpreter. For a bit more background on the amazing life of Helen Keller, watch the mini-documentary above. i am an ITP student in my fourth year now...amazing to enter this world that is the deaf community and see so much ignorance and misinformation that surrounds it as well. As a minority myself (hispanic) i can understand the frustration in becoming a representative of the community to those hearing people around you, but mostly we laugh it off A LOT because in the end we have to educate but also move on. I like this site because rather than just giving you a sign it puts it in context. When i get a better paying job i will surely pay for the site ;) but im still in school but i appreciate your work on the site keep it up. I am often asked "I can't find the sign for....." And it will be words like FINALIZATION or SUMMARIZATION. My answer is often...."It is there." You may not get a result when you search for FINALIZATION, but that does not mean you are out of luck. Unlike the spelling in the English language where one spelling is equal to one word, sign language is different. There are many signs that can mean more than one word. We have tried to connect any of the signs on our site with the English words they can represent, but this is not always possible or practical (as there are hundreds of thousands of potential word variations). If you are having trouble finding the way to sign a certain word, think about what the true basic meaning of the word is, then, like using a thesaurus, look up words that could be interchanged with the word you are looking for without drastically changing the meaning. An example: FINALIZATION - Think of the meaning you are looking for....How are you using the word? Is it that you want to FINISH? Or would the word LAST work better for you? Be sure to use the word that will be the most conceptually correct in the context that you are using the word. A second example: SUMMARIZATION - We do have the word SUMMARIZE so maybe that will work for you. If not that sign, what about to SHORTEN, or to make SMALLER. I have seen both of those signs also used for SUMMARIZATION. The biggest misconception is that there is one sign for one word and when translating from English to ASL, you must do a direct and exact translation. This is not the case. I think it is very interesting to watch five different interpreters signing the same exact story. I can pretty much guarantee that there will be variations. That is fine as long as the general concepts of the story are all there and clear to the client. In summary, my advice when signing (and using the Signing Savvy site) is to think like a thesaurus and focus on the core concept or meaning of what is being signed and not get hung up on the exact English words you are translating. Facial expression plays a very important part in the meaning of a sign. The same exact hand-shape and movement can totally change meaning because of the facial expression that is used to accompany it. One example of this is the word MUCH. The degree of how much can totally be determined by the facial expression alone while the sign stays the same. Other examples would be the words INTERESTING and FUNNY. Both of these words can be changed to different varying degrees all by the changes in facial expression. One question that some users have asked then is why we don't show a great deal of facial expression in most of the videos on the site. This is a legitimate question. With the video on the site, we have focused more on the formulation of the sign (the hand-shape and movement). We understand that in your day-to-day signing, there would be more facial expression used depending on the emphasis in the context of the sentence. Not only the hands, but also the face, the eyes, and the whole body work together to communicate in sign language. Because of this, we want to inform people who are using sign language that the wearing of sun glasses, excessive jewelry or facial hair that is long (like handlebar mustaches and long beards), can be distracting to the person you are signing with. If you ever watch an interpreter while working, they will be wearing solid dark colored clothing (as opposed to patterns) with very little jewelry and no sunglasses! This all helps in communicating clearly to the Deaf client through both signs and facial expressions. clothing would be better. While the object is for the hands to stand out , to have a contrasting background so as to be clearly read. One question many new signers ask me is: "What is the difference between ASL signs and English signs?" and "What does it mean to have an initialized sign?" These are two really good questions. It is important to understand the difference, particularly when signing to a member of the Deaf community. You may have noticed that sometimes people are referred as deaf (little d) and other times as Deaf (big D). This is done for a specific purpose. People that are deaf have partial or complete hearing loss. Deaf (big D) people are not just deaf by way of auditory definition, but culturally as well. They are usually born deaf. They don't normally use their voice when they sign. Many of them may also choose not to use hearing aides, cochlear implants or any other sound enhancing devices, even if they may get hearing benefit from them. They instead choose to use sign language as their primary mode of communication. Through sign they utilize interpreters in order to communicate with the hearing world. Most deaf people; whether big D or little d, do NOT like to be referred to as Hearing Impaired. Instead they want to be identified as Deaf or Hard of Hearing, depending on their degree of hearing loss. I give you this brief history just to give you some background before answering the ASL verses English question. This topic can become very involved and very political and we at Signing Savvy are not wanting to lose our focus of being a sign language resource for all, so we choose normally not to get too involved in these kinds of debates. ASL (American Sign Language) is a complete, unique language developed by deaf people, for deaf people and is used in its purest form by people who are Deaf. Being its own language, it not only has its own vocabulary, but also its own grammar that differs from English. Signed Exact English is a system to communicate in English through signs and fingerspelling. Signed Exact English, in most cases, uses English grammar (that is, you are signing English). The vocabulary is a combination of ASL signs, modified ASL signs, or unique English signs. The reason English signs often vary from ASL is to add clarity to the sign so that the exact English word meant for the conversation is understood. One example would be the sign for CAR. In ASL, the sign for CAR is two A hands gesturing like they are holding onto and moving a steering wheel. In ASL, this sign is used for any automobile you control with a steering wheel, including a car, truck, bus, van, etc. The English sign for CAR is two C hands, one on top of the other, moving away from each other. If you wanted to specify what type of car, the hand shape is modified to include the initial of the type of vehicle (c for car, v for van, b for bus, j for jeep, etc.). This is where the term "initialized sign" comes from. You clarify the meaning by initializing the sign with first letter of the intended English word. Therefore, using the English version allows one to specify exactly what is communicated in English. In ASL, you would just use the ASL sign for car and if it was important to clarify the type of vehicle, you would follow the sign with a fingerspelling of the vehicle type (JEEP, for example). This is just one example. There are many other examples. Just as many ASL signs are used in Signed Exact English, members of the big D Deaf camp have accepted some English signs. However, some are still not accepted, and if you use them in your everyday signing, could be frowned upon by the Deaf. It is best to watch and ask if you are in doubt. What type of signs does Signing Savvy include? Since Signing Savvy is first and foremost a dictionary, we have decided to include the most common variations (both ASL and English) on the site so that you see that they do exist. Since ASL is the preferred language of the Deaf community, the ASL sign is almost always listed as the first version unless the word does not have an ASL sign for it. 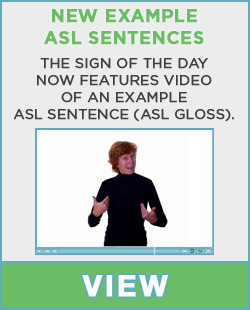 To determine if the sign is ASL or English, look below the video to see the sign type (available on most signs). If you are a registered guest or full member, the sign description tells you if it is an initialized sign. Remember that most of the time if the sign is an initialized sign, then it falls under that English category. There are a group of verbs that are often referred to as Directional Verbs. These are also known as Indexical verbs or Verb Agreement. These verbs do just what the term suggests; they show directionality. They do this by using an element of motion that indicates one or more referents (see post on Setting Up People, Places, and Things for more on referents). These verbs can be used pretty simply by setting people up, then using direction to show who is doing what to whom. I will give you some examples to make it clear using the word/sign SHOW. First you set up someone on the right, lets say DAN, by fingerspelling his name on the right side of your signing space. Then you set up someone on the left, lets say JACK, by fingerspelling his name on the left side of your signing space. Then just by using the sign SHOW and moving from the area on the right, to the area on the left, you are signing DAN SHOWED JACK. If you went from the left to the right, you would be saying JACK SHOWED DAN. Once again, the act of moving the sign gives the meaning of whom is doing what to whom. Other directional verbs include borrow, give, see, pay, invite, help, send, and bite. Directional/Indexical signs can be very fun to use and make your message so much clearer when used properly. Should not item 4 be JACK SHOWED DAN? Re: Who did what to whom? That is correct. Item 4 has been revised.